There’s nothing more exciting for your four-legged best friend than a visit to a city, county or state park. He can run free in a fenced-in area or walk on a leash in a natural setting. Some of these parks offer canine training, too. 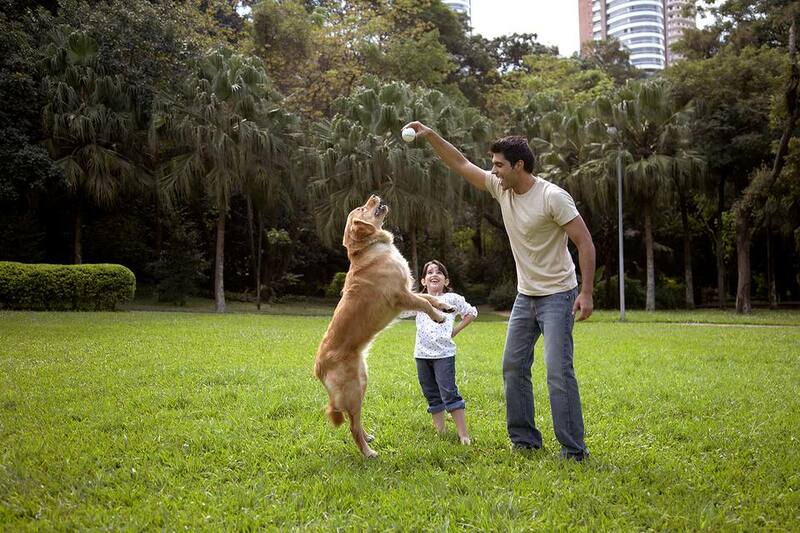 Broward County, Florida offers 10 great dog parks. Puppies four months and younger are not permitted, and food is also prohibited. Read all the rules specific to the park you've chosen before you head off to one of these doggy playgrounds. Safety Notes: It’s always wise to use flea and tick control when your dog will be around his peers. You may be able to control the behavior of your dog, but you can't control other dogs, so be alert to aggressive dog behavior. Leave the park if you don't feel your pet is safe. Consider visiting or calling the park office to report any aggressive pets. Never leave your wallet or purse in your car – even if it's hidden from sight - to avoid smash-and-grab robberies that are so common these days. TY Park is 138 acres of natural beauty and it's my favorite of all the Broward County Parks. There are countless gigantic shady oak trees and many great spots for picnicking. Two miles of paved walkways are perfect for a walk or jog with your leashed dog. There’s even a popular walking club at the park. Beware of the many squirrels that eat the acorns off the oak trees. If your dog is anything like mine, he'll yank you trying to chase them. Just to the west of Markham Park’s entrance is a three-acre fenced-in grassy area just for dogs where they can run leash-free. There are wide paved paths for walking or running with your dog, too, as well as doggie drinking fountains, a dog washing area, and three shelters. The 92-acre Snyder Park has fenced off a large grassy area for dogs to run free. There are separate areas for large and small dogs, agility equipment, hosing stations, drinking fountains for canines and humans and benches for dog owners. Bark Park is staffed with a supervisor for extra safety. Canine Corner is a large fenced-in grassy area where dogs can run leash-free and it has very secure gates. There are no separate areas for small and large dogs. There is not a lot of shade here and only a couple of benches are available for dog owners, but you can always bring a blanket and sit off to the side in the grass. Water bowls for your dog and poop bag dispensers are provided. The Dr. Steven G. Paul Dog Park is a favorite among Coral Springs dog owners. The dog park is part of the sprawling 182-acre Coral Springs Sportsplex. There are separate fenced-in grassy areas for large and small dogs, paved walking/running paths, agility training equipment, swimming pools, drinking water and a dog washing area. Although dogs are not allowed on the beach here, there’s plenty of room for your leashed dog to roam in this 310-acre state park. The best way to enjoy time with your pet is to plan a picnic with family or a group of friends in one of the many picnic areas off the beach. This neighborhood park has separate areas for large and small dogs to run leash-free and some dog agility equipment. There isn't a lot of shade in this park, but dog owners and their pets seem to love it here. Riverwalk is a regional park but it's more as an urban oasis. A long, meandering, tree-lined, brick-paved path loops all along the New River around shops, restaurants, historic buildings, and the Broward Center for the Performing Arts. It's a fantastic place to stroll with your dog, watch boats as they pass by and just linger a while in the shade. It’s such a popular place for pooches that poop bag dispensers are provided all along the path. Your dog must be on a leash here. With 243 acres, Tree Tops is one of the best walking parks in South Florida. With over 11,000 feet of trails, you can take your leashed dog on a long hike and observe the abundance of wildlife in the park. Colohatchee is a beautiful 8.5-acre mangrove preserve with an elevated walkway over the wetlands. Fenced-in dog play areas where dogs can run leash-free are located at the back of the park. All dog owners must register and pay an annual permit fee for their dogs, helping to keep the dog play area safe.